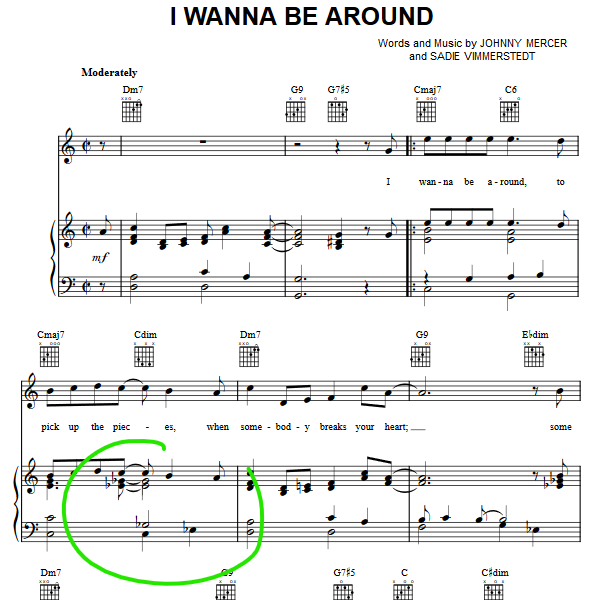 Where does the Eb diminished 7 in I Wanna Be Around come from and how to play over it? I am interested to know where the Eb diminished 7 in the first 4 bars of jazz standard I Wanna Be Around come from? My guess was that it relates as being a sort of tritone substitution for the V of the D-7, which is A7. Does this make sense? My next question is how would you approach it when playing over the intro changes? We are nicely in C and then the Ebdim7 pops up. I have been playing a Diminished arpeggio but it feel s but boring! I was also considering that Ebdim7 is the same diminished system as F7b9 which could be viewed as a Csus13b5#9 which TBH doesn't make much sense as a usable chord but maybe it could be used to played a mixolydian or altered scale? Another option is that B7b9 is also part of Eb diminished scale and of course can be seen as the VII of C major. Perhaps I am over thinking this! Any thought? Thanks in advance! Either way, we usually see an Eb bass note for at least the second half of the fourth chord. I'm not sure we can explain it as a substitution for A7, dominant of D, as the tritone C# - G is not present. Maybe we have to accept 'passing dim7 chord' as its own category. What I'd play over it is the original melody, unless I was very sure I had something better! The main progressions in jazz are I ii V I jazz cadence and the I vi ii V7 progression. Eb dim7 is actually a chromatic VIIdim7 to dm. Not the answer you're looking for? Browse other questions tagged theory chord-theory chord-progressions jazz solos or ask your own question. How to determine the key and write melodies for a chromatic chord progression? Can a song contain pitches outside of its intended key? Where does this chord come from? Why do tritone substitute dominants have tensions 9 #11 13?